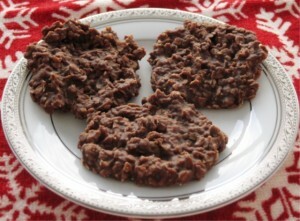 My bloggie friend Susan, posted this wonderful recipe for Chocolate Oatmeal NO-BAKE cookies, on her website, which sounded so easy, and looked so delicious, that I just had to try them. Wow, these babies were absolutely scrumptious!! According to Susan, this recipe has been around for a while, and she has been snacking on these on many occasions. One would say – How can anything as wholesome and simple as Oatmeal, be mixed with something so good as Cocoa Powder, require NO BAKING, and turn out as a yummy cookie? Well, you will not believe it until you try it yourself, and then be pleasantly surprised. Some of my family members never acquired the taste for Oatmeal, but they did not have any problems to practically “inhaling” several of these cookies, with a nice tall glass of milk. This is how the cookie batter looks like, once ready to form cookies. In a large sauce pan, combine sugar, cocoa powder, milk, and butter. Mix it all well to incorporate all ingredients. Add peanut butter, and vanilla extract. Mix well with a spoon, until the peanut butter dissolves. 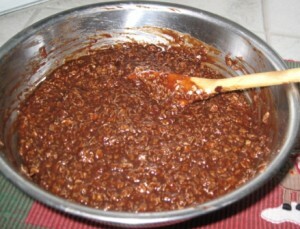 Add oatmeal, and incorporate evenly into the chocolaty mixture. Prepare a cookie sheet by lining it with waxed, or parchment paper. 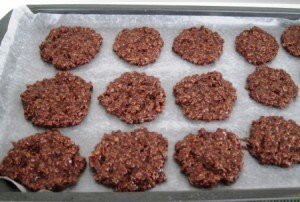 Drop mixture by spoonfuls onto to lined pan, spacing cookies, so they do not touch. Cool for at least 30 minutes, to let them set (I placed the pans in the refrigerator for 15 minutes to cool, since my granddaughter and I could not wait to taste them). These look really really good. Maybe too good actually since you’ve already warned us how addictive they are. For as simple as they are to make, they are really yummy. Spring is just around the corner, so walking is great for burning up calories. These look yummy and I think we have these ingredients! We made chocolate chip ones not too long ago, I think they were mint chocolate chocolate chip, they were really good! 🙂 First time from scratch too! 🙂 Hope you have a great day! I love the combination of chocolate and mint, or nut, or chocolate….anything blends well with chocolate….yum. Thank you sharing your comments.